Run and buy tickets if you'd like an evening of delight. You will find Pergolesi's scintillatingly silly mini-opera performed by 2 singers in complete control of their material - and with acting chops to boot - and a mute actor who possesses spot-on timing and hilarious solemnity. 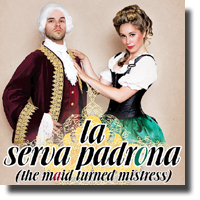 La serva padrona is precursor to Mozart's Le nozze di Figaro with its cast of clever servants who manipulate their employer. Serpina (Allison Cociani) has been brought up - and spoiled rotten - by Uberto (Damon Beryl Schwabach-Morris) who has worked his way up in the world and is not about to risk his position by marrying down. With the help of the much-abused Vespone (Astrid Varnes) Serpina gets her man and all ends happily. Allison Cociani is a delight to watch and to hear. Her light and agile soprano is full of charm and she is coquettish, affectionate and determined by turns. Baritone Damon Beryl Schwabach-Morris manages the florid Baroque technique with equal skill and stage presence. His opening arias "Aspettare e non venire" and "Sempre in contrasti" nicely described a put-upon man with comic drama. The repetition so characteristic of music of this period never became tiring, due to the variety and life each brought to their performance. Both singers together, especially in the duet at the end of part 1, "Lo conosco a quegli occhietti" and the final duet "Per te ho io nel core" were priceless. The funniest performance though came from Astrid Varnes' Vespone, the man-servant. From quietly trying on hats and drinking the master's chocolate, she drew a character whose actions gradually increased in desperation until he/she took the stage by storm as the dangerous 'Captain Tempesta.' With new confidence she changed costume again and bewigged and gowned as a notary married the happy couple. Stage direction by Robin Eder-Warren was a masterpiece of controlled mayhem. At first glance the set was cluttered with props and the action very busy, but this never distracted from the singing but rather supported the zestful characterization and zany plot. The very able Ian Dives conducted a tiny orchestra from the harpsichord. The harpsichord is modern and digital, in contrast to the baroque bows used by the violinists and viola players and which were perhaps the source of their excellent articulation. The verve and musicality was the players' own. Supporting the whole was the steadfast, sonorous, musical playing from Genevieve MacKay on viola da gamba. Costumes by Stephanie Ko were colourful and elegant, lighting by Noah Fever made the best of the church facilities. The set showed evidence of a small budget and a big imagination. Because the opera is a mere 45 minutes, a programme of hits by Handel began the evening. This both attuned the audience to Baroque music and acted as a showcase for several other members of the Opera Mariposa company. Of particular note were moving interpretations of "Ombra mai fu" and "Svegliatevi nel core" sung by mezzo LisaMarie Bresett and "Tornami a vagheggiar" from Alcina and "Lascia ch'io pianga" from Rinaldo dramatically sung by Allison Cociani. Excellent diction and intonation from all. Unfortunately the orchestra, so skilful in the second half, appeared a little under-rehearsed.